“Ethics” is used as a label for a new kind of expertise in the field of science and technology. At the same time, it is not clear what ethical expertise consists in and what its political status in modern democracies can be. Starting from the “participatory turn” in recent social research and policy, we will argue that bioethical reasoning has to include public views of and attitudes towards biomedicine. We will sketch the outlines of a bioethical conception of “public understanding of ethics,” addressing three different issues: (a) the methodological relevance of moral questions and problems raised by lay persons in everyday life regarding biomedicine and technology, (b) the normative relevance of such lay moralities for the justification of ethical decisions, and (c) the necessity of public deliberation in this context. Finally, we draw conclusions in view of the concepts and methods such a conception of “public understanding of ethics” should employ. A preliminary version of this paper was presented at the conference "Ethics in Public Life" in March 2010 in Salzburg and published in the conference proceedings (see Schweda and Schicktanz 2010). Chapters 4 and 5 of the current paper are widely based on this preliminary version. An erratum to this article can be found at http://dx.doi.org/10.1007/s11019-012-9393-9. Alongside the established academic discipline and its theoretical discourse on moral philosophy, “ethics” has emerged as a label for a relatively new kind of public actors and procedures in the field of science and technology during the last decades (Nowotny et al. 2001). This “ethics industry” (Lancet 1997), as it has been called ironically, comprises a complex and intransparent scenery of new specific experts, new institutions (boards, committees) and new regulations or at least normative agendas (guidelines, soft laws), in various social contexts and on different political levels. In 2001, for example, George W. Bush established the President’s Council on Bioethics and endowed it with authorities and resources in order to “advise the President on bioethical issues that may emerge as a consequence of advances in biomedical science and technology” (President’s Council on Bioethics 2001). And in the same year, the European Commission declared in its Science and Society Action Plan that ethics is an integral part of the EU research policy and recommended “the fostering of networks of ethical committees at both national and local levels” as well as “the development of an international dialogue on ethical principles through conferences and workshops” (EC 2002). In these contexts, “ethics” does not simply refer to a scholarly way of moral philosophical reasoning and teaching, but extends to a whole field of social roles and practical functions which are not necessarily occupied by academic ethicists. Its aim is seen in the optimization of decision making processes on different political levels and in various areas of professional practice. In this sense, it is described as governance ‘solution’, an instrument for the regulation of new social and technological trends (Nowotny et al. 2001; Jasanoff 2003; Fox et al. 2008). This development raises a series of important questions. From a global socio-historical point of view, the meaning of the phenomenon itself is discussed: How far can the evolutionary boom of a rapidly proliferating “ethics industry” be regarded as symptomatic of recent social trends, e.g. of a crisis of accustomed forms of government, or governance, in an increasingly complex scientific civilization (Beck 1992) or of the high reflexivity of late modern, post-traditional and pluralistic societies (Giddens 1991)? Furthermore, it is examined how “ethics” functions as a social practice or power play (e.g. Haimes 2002; Fox et al. 2008), a disciplining and normalizing mechanism (e.g. Frank and Jones 2003), a novel type of ideology (e.g. Koch 2006), or just a way of assuring the interests of an academic profession—as insinuated in the pointed slogan that “medicine saved the life of ethics” (Toulmin 1982). More recently, various social scientists also criticise the progressive “ethicization”, mainly referring to two arguments: First, there is the concern that (soft) ethics replaces (hard) politics and law, and therefore science and technology will develop without any clear and definite limits (Bogner and Menz 2005). Secondly, it is assumed that if ‘ethics’ is only conceptualized as western, analytical ‘arm-chair’ philosophy, it is insensitive to cultural differences or even part of a problematic colonization (Fox et al. 2008). We do not share this line of argument in general, but we think that it is indeed necessary to reflect on this phenomenon, especially with an ethical eye. After all, ethicists and ethics institutions interfere with public and political dimensions in manifold ways. They give advice to governments, make ‘expert’ statements for parliaments and formulate recommendations for many fields of practice. At the same time, however, it is not clear whether ethics expertise exists, at all, what it consists in, and how its increasing political influence can be justified. How can ethical expertise be understood, modified and expanded in order to strengthen the current trend—a trend that seems reasonable and desirable to many ethicists? In recent social research and policy, critical debates about (social scientific) expertise and the interrelation of science and society have led to an increasing inclusion of public views and experiences. In this article, we will argue that there are good methodological and normative reasons for bioethics to take an analogical way by including public views of and attitudes towards biomedicine. This is in line with the recent trend of including empirical studies more directly into bioethical reasoning. Our study is part of an ongoing research project in which the “public understanding of ethics” is investigated on an empirical (Schicktanz et al. 2008; Schweda and Schicktanz 2009) and on a conceptual level (Schicktanz 2009; Schweda and Schicktanz 2010; Wynne 2006). 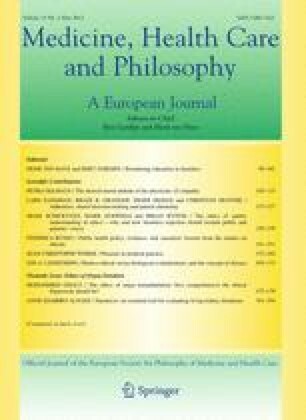 Based on our earlier work, this paper elaborates this line of thought much further with regard to the critical assessment of ‘expertise’, the dialectics between social science and ethics in the field of empirical ethics and the particular relevance of discussing the inclusion/exclusion of public/patient perspectives. We first give a brief introduction to the recent discussion around ‘ethical expertise’, appraising the concept’s value and critically assessing some of its perplexities. Under the slogan “ethics of public understanding”, we then use the evolution of the participatory paradigm in more recent social studies of sciences and medicine as a starting point and explicate its normative motives and underpinnings. In analogy to this development, we then sketch the outlines of a corresponding bioethical conception of “public understanding of ethics” in the next section, addressing three different issues: (a) the methodological relevance of moral questions and problems raised by lay persons in everyday life situations in the context of biomedicine and modern technology, (b) the normative relevance of such lay moralities for the justification of ethical decisions, and (c) the necessity of public deliberation in this context. Finally, we draw conclusions for the concepts and methods such a conception of “public understanding of ethics” should employ. The list of ethics experts and ethics committees is expanding, especially in medicine (e.g. Schicktanz 2008). They are appointed or implemented on local, regional, national or even international levels. Their legitimization follows an expertocratic pattern as it is common in many contexts of contemporary policy making (Reck 2003): Their political influence is not justified with reference to democratic procedures such as majority votes, but with expertise. Generally speaking, expertise is understood as some superior and/or exclusive form of knowledge and competence in a particular field which can be acquired through training and experience (Ericsson et al. 2006). In this sense, it is usually supposed that trained scientists examine causal, functional or statistic relations in nature and society with technically sophisticated equipment and laborious procedures, accumulating—it is supposed—solid knowledge about facts and probabilities. Of course, this concept of scientific knowledge—related with truth and objectivity—is highly disputable, e.g. starting from Popper’s critical rationalism or from social constructivism. Nevertheless, as modern societies are characterised by uncertainty and risk, scientific knowledge seems to be highly important, if not indispensable. Thus, scientists are given licence to tell us how the world ‘is’ (and hereby often implicitly how the world ‘should be’) because they are supposed to know best—or, at least: better. The idea and necessity of policy advice by specific experts is rather widespread and in general uncontroversial. However, the application of the expertocratic model to the field of ethics causes serious difficulties and perplexities (for an overview, see Steinkamp et al. 2008; Rasmussen 2005). In contrast to more traditional notions of scientific expertise, it is less obvious what ethics expertise consists in or what its basis and its quality standards are. After all, ethics is not primarily concerned with facts, but with values and norms. It is questioned whether the term ‘knowledge’ applies here (Scofield 1993). The fact that the “battle of experts” is fought particularly fiercely and intransigently in this field supports the idea that ethics merely relies on subjective views, relativistic argumentations, and feelings (Cowley 2005). Furthermore, the notion of ethical expertise contravenes modern egalitarian sensibilities—one of the leading paradigms of modern ethics, itself (Lagerspetz 2008; Scofield 2008): As almost everybody has some set of moral values and principles, it is not clear how anyone can claim universal expertise in this area. Does this claim imply that some peoples’ values or principles are “superior” to those of others? And if so: For what reasons? What specific kind of knowledge or competence do ethics experts have (Birnbacher 2002)? And what political role and influence should they play (Delkeskamp-Hayes 2005)? In order to answer these questions, a first crucial distinction has to be made between ethics expertise and moral expertise. It presupposes the distinction of morality as a set of rules and values actually guiding individual life and social interaction—and ethics as its normative reflection, justification or critique in view of validity, desirability and legitimacy. In this sense, ethics expertise as a theoretical competence involving particular methods of reflection and justification is distinguished from moral expertise as a specific moral sensitivity and authority not necessarily resting on explicit theoretical reflection, but rather on education, practice and experience (Düwell 2000). Insofar as this distinction presupposes the expert-lay-divide, it needs at least some clarification: On the one hand, public moral positions and arguments almost always seem to entail some sort of ethical reasoning. At least in view of modern pluralistic societies—in the ‘reflective age’—it is hard to defend that people blindly follow some set of intuitions or rules. Instead, in everyday life we observe that—at least occasionally—we are reflecting on moral intuitions or rules, are arguing about them and trying to justify them with reference to higher order principles. In this respect, the strict distinction between morality and ethics can be called into question. There is no clear demarcation line between lay moralities and ethical (academic) reflection, but rather a continuous interactive spectrum: both involve normative reasoning and discussion, albeit to a different extent and on different levels of theoretical sophistication. This also holds true in the converse perspective: Normative ethical reasoning obviously does not float in a social vacuum. It is performed by concrete persons with their own moral convictions and situated in socio-cultural contexts which often involve specific social roles and moral rules. Even if ethical reasoning aims at an “ultimate justification” or a radical critique of particular norms, it usually has to start from some set of consensual moral convictions on what is important, right, just. In applied ethics, this connection has been theoretically captured in the justificatory model of a “reflective equilibrium” between theoretical reasoning, ethical principles and concrete moral judgements (Daniels 2003). ethics expertise is identified with the ability to justify one’s moral judgements in a coherent way (Yoder 1998). However, the reliance on and trust in ethical expertise depends on the (meta-)ethical approach (or philosophical school) one belongs to: Only partisans of rationalism and cognitivism share the idea that strong justification allows the (rational) assessment of good and bad arguments. Here, the relevant criteria for ‘expertise’ are rationalism and argumentation. Partisans of more relativistic, theological or pragmatic ethics approaches might see wisdom and experience as relevant criteria. Thus, we have to bear in mind that even within the ethics community itself, there is neither consensus on the ultimate criteria nor the certainty that all ethics expertise can fulfil these criteria. Therefore, we want to point out the general need of a self-critical discussion of the idea of ethics expertise in ethical debates. This does not imply a plea for the abolition of ethics in public debates. In a similar crisis of the concept of expertise, social sciences and policy research discussed the implications of scientific ‘expertise’ and its relation to public views on science and medicine. One consequence of this process was the discovery and inclusion of the public, its perspectives, attitudes and experiences, not only as an object, but as a subject of research (Lengwiler 2008), and as an agent of policy also beyond parliamentary representation. This initiated a “participatory turn” (Jasanoff 2003) that was based on shifts in theory and methodology. This turn indicates a fruitful route for other disciplines, too, including ethical reflection and bioethics as a form of policy advice. The history of social studies of science can be roughly described as a three stage development: From the rather expertocratic approach of measuring and increasing “science literacy” among a passive public audience, over the paradigm of “public understanding of science” (Abbr. PUS) with its focus on public attitudes to the participatory idea of actively engaging the public (Bauer et al. 2007). The shift from one paradigm to the next was induced by crises and normative concerns. After briefly sketching these paradigm shifts, we want to explicate their underlying normative motives in order to gain orientation for the debate on ethics expertise. When social research on the uptake of science among the general public started in the late 1960s, its primary concern was of an educational nature: The general public should be informed about scientific methods and knowledge so that they were enabled to act as competent citizens in a science based society (e.g. Bybee et al. 1980). The underlying idea implied a ‘deficit model’ (Wynne 1991, 1992) of PUS which presumes that the public usually has a considerable lack of knowledge on and understanding of science and is in need of proper information in order to make the adequate democratic decisions. Large-scale quantitative surveys were carried out in order to measure ‘science literacy’ among the general public (Miller 1998) and educational efforts were conceived to improve this literacy. Under the impression of results from the British Bodmer Report (Royal Society 1985), the focus of PUS research shifted from measuring and increasing public knowledge about science to examining and influencing public attitudes towards science (Bodmer 1987). Nevertheless, the underlying deficit model still remained rather influential. Thus, it was presumed that public ignorance about science leads to irrational reservations and fears and therefore nurtures anti-scientific or anti-technological attitudes (Sturgis and Allum 2004). However, on the background of various technological crises (e.g. Chernobyl, Sellafield, BSE) in the 1990s, the normative assumptions on the relation of science and society and the role and status of science and scientific expertise implicit in the deficit model were discussed critically (Wynne 1993). In contrast to the preceding survey research, qualitative methods and active engagement and inclusion of the public were frequently recommended as indispensable ways of re-establishing “trust” (Irwin 2006). From an ethical point of view, this ‚participatory turn’ in the social sciences and in policy appears particularly interesting because it brings to bear a normative perspective (see also OWN REFERENCE 3, 227 f.): First of all, it is a self-critical development in which expert roles and the socio-political function of research (in science and humanities) are reflected, questioned and criticized. Furthermore, it is based on—often implicit—normative assumptions about what the public is, at all, and why it should be taken into account or engaged (Gerhards et al. 1998). Insofar as these assumptions are justified, they are relevant for bioethical reasoning, as well. They can motivate a normative interest in public views of, attitudes towards and interactions with moral questions and problems in the context of biomedicine, e.g. concerning abortion, in vitro-fertilization, allocation in health care, and more recently, embryonic stem cells procurement and research. In analogy to the sociological interest in public perceptions of science and technology (and the term “public” is often used in a very broad meaning, here), the object of the corresponding ethical interest could be described as “public understandings of ethics” (see Schweda and Schicktanz 2010, p. 68). The concept includes public concerns about scientific and technological developments, but also comprises all other forms of argumentation, justification and normative judgement, e.g. about why it is morally problematic to use embryos in medical research or to withhold genetic information, or how to respect a patient in a clinical setting (e.g. Raz and Schicktanz 2009). In a broader sense, the term could also be used to denominate social research on public views of and attitudes towards the role of ethics and ethicists in many social and political contexts—a field hardly investigated, so far. But why should “public understandings of ethics” be of any relevance at all for normative ethical reflection? After all, there seems to be no direct way of deriving normative conclusions from socio-empirical observations, of inferring from what people believe to be morally right to what really is right. In the course of the so called “empirical turn” in applied ethics, these questions have been discussed intensively and controversially (Borry et al. 2005; Birnbacher 1999). In general, this “empirical turn” refers to the increasing number of quantitative surveys or qualitative studies (e.g. interviews, direct observations) which collect views of doctors, students, nurses, lay people, lawyers, or ethicists on a certain bioethical topic. (To be perfectly precise, it would even be better to label it socio-empirical ethics, because in applied bioethics, also empirical facts from natural sciences are integrated, but this is not the issue of this paper). In the following sections, we will critically discuss why “empirical ethics” itself has to reflect on “how” and with whom empirical research is done for ethical argumentation (Schweda and Schicktanz 2010, pp. 69–71). Basic normative convictions should lead to methodological decisions that acknowledge that the “public” and “patients” can be of particular interest in comparison to other opinion holders. Let us start with some general considerations about empirical ethics. In general, many arguments in favour of empirical ethics are methodological. They claim that the epistemic quality of ethical theorizing improves by including additional empirical information. Thus, socio-empirical research can function as a trigger of ethical reflection. It can point to remote or emerging moral problems (Levitt 2003). For example, the statistic finding that there is a significant gender imbalance in living organ donation can give rise to moral concerns about justice and exploitation between men and women which have not been discussed in the ethics of organ transplantation, before (Schicktanz et al. 2010). Furthermore, many applied ethical arguments rely on certain socio-empirical assumptions. Thus, so called “slippery slope” and “automatic escalator”-arguments (Holm and Takala 2007) are based on premises about human behaviour and future social consequences of actions. Empirical research can be employed to examine and thus strengthen or criticize these premises. Finally, empirical research can increase the context-sensitivity of ethical reasoning by highlighting relevant framework conditions and factors of concrete practical decisions (Musschenga 2005). This is also important since most normative theories involve the idea that considered judgements and ethical orientations should eventually be implemented in social reality, and the corresponding approaches to moral education and implementation also rely on empirical information (Birnbacher 1999). Of course, these three lines of argument do not answer the question whose opinion is of particular importance: Do e.g. medical doctors have a better insight in what is a moral problem in the clinical practise of health care rationing than nurses? And do natural scientists have a more valid opinion about what could be future risks of biotechnology than social scientists? The first intuitive answer might be that it depends on the context of the questions to be answered. But as we will show later, this is insufficient. It is particularly important to make sure that the opinions of those who will be affected by the decisions in different ways are sufficiently considered on the levels of problem identification, examination of empirical premises and application of normative directives. Besides these three general arguments in favour of integrating empirical research into bioethical reflection, there is also a more polarized controversy about empirical ethics. This controversy deals with the role of socio-empirical studies for the normative justification of ethical principles (Musschenga 2005). On this level, there is traditionally serious scepticism about the relevance of empirical research. The main line of critique is based on the natural fallacy-argument and objects that it is logically incorrect to derive normative judgements from empirical facts. However, this criticism does not recognize that most of the relevant contemporary ethical conceptions actually already argue for the inclusion of the public in one way or the other, as long as the ethical decision is not merely seen as an individual one, but also has a public, social dimension. Thus, many prominent deontological and consequentialistic approaches proceed from the idea that the ‚neutral or moral point of view’ is essentially characterized by impartiality, that is, the fair consideration of all relevant standpoints (Jollimore 2006). In this spirit, an interactive, deliberative conception like Discourse Ethics combines a general concept of rationality with the principle of being affected, arguing that only those norms which could theoretically achieve the rational consent of all persons affected can claim genuine legitimacy (Habermas 1990). And an important consequentialistic position like Preference Utilitarianism demands that the preferences of those affected by decisions have to be considered (Singer 1979). However, the ethical consideration of those who are affected is often done in a rather schematic and abstract way. On the other hand, other ethical approaches challenge this idea and question whether schematic impartiality can really do justice to all relevant positions. Thus, in common sense-based, hermeneutic, pragmatist, and Aristotelian approaches such as Communitarianism, common morality and concrete public perspectives are usually seen as a methodologically indispensable starting point and normative source for ethical reflection (Kuczewski 2009). And in feminist and care ethics, the specific points of view and relations of those involved in a concrete situation are particularly important and are defended against ethical reasoning based on abstract principles (Held 2005). As we have seen, contemporary ethics already provides manifold normative arguments for including public perspectives in one way or the other. From an epistemological point of view, however, it is arguable whether one single person is really cognitively capable of impartially considering and weighing all relevant perspectives in a monological reflection: “Given the conception of the impartial point of view as a ‘God’s eye’ point of view, …, it seems questionable whether it is ever reasonable to expect a human moral agent to be able to occupy such a perspective” (Jollimore 2006). This epistemological scepticism seems particularly striking when it comes to bioethical conflicts: Who could really claim—e.g. as a physically and cognitively functioning person in a secure social setting—to be able to put himself in the position of somebody who has a different socio-cultural background, lives under desolate social conditions, has another gender or is chronically ill or disabled? As we have argued earlier (Schicktanz et al. 2008, pp. 60–62), the concept of ‘being affected’ plays a crucial, but ambiguous role in this bioethical context: On the one hand, it refers to an objective relation between a state of affairs and a person (or a number of persons). For example, one can be affected by radioactivity without regarding oneself as an affected person or even taking notice of one’s own affectedness. On the other hand, it can also be used to denote a mostly negative emotional reaction that involves feelings like dismay, concern and empathy with the suffering of others. These are two reasons why patients and their relatives can be classified as ‘affected persons’ in the biomedical contexts—while taking into account that ‘being affected’ depends on medico-technical classifications as well as on epistemological categories. Many affected persons claim to have exclusive insights which rest e.g. on a specific embodied forms of experience such as suffering or an individual patient history. In this context, ‘experience’ means a procedural subjective knowledge that combines cognitive, emotional, moral and social dimensions. For our purpose, these experiences should be communicable on an inter-personal level. Of course, these epistemological claims need consideration as being affected may not lead to a superior perspective, but merely to a different one. But without denying the effects of communication, compassion, role reversal and mediated experience, there is a strong plausibility that some particular experiences cannot (sufficiently) be reconstructed from an external point of view. According to the philosopher and legal scholar Melissa Williams, a fair and just public discourse needs at least some direct representation of the voices of those who are minorities or live in dependence because the majority groups (here experts) do not share their particular history and experience of being dominated, marginalized, or excluded and are therefore likely to lack the ability of understanding their specific situation and concerns (Williams 1998, p. 131). In the context of medicine, this argument is very striking. Thus, patients share experiences of asymmetries, pain, dependence, fears, and helplessness which are often ethically relevant, but are not sufficiently considered by doctors who want to work efficiently, successfully and time saving. All the above mentioned theories amount to a theoretical argument for transforming individual, subjective reasoning into an inter-subjective process which allows the abstraction from own interests and experiences. As we argue in the next section, these normative considerations have methodological implications for ‘empirical ethics’: If we accept that a (morally) legitimate decision has to be based on the rational agreement of all affected persons or at least has to take their views and attitudes into account, the question is how bioethics can access these views and attitudes practically. Following the politico-ethical ideal of autonomy as self-determination and self-development as an actively engaged agent, those affected by a decision should have a say in the decision making process. Therefore, the identification of informants and the composition of samples, that is, the question of who should be included in the research design, turn out to be issues of high normative relevance: Who should take part in an interview, participate in a focus group or attend a participatory setting? To answer these questions, we have to decide whose voices should count in a given situation and justify our decision (especially in cases of limited research resources). For this purpose, the concept of ‘being affected’ itself needs critical reflection (Schicktanz et al. 2008, pp. 69 f.): The (self-)ascription of “being affected” can involve several factors, from types of knowledge to social roles and moral ideals. Furthermore, there may be different ways of “being affected” which have to be assessed and weighed differently, e.g. being directly or indirectly affected or being actually, prospectively or potentially affected. Thus, the criteria for ‘being affected’ have to be made explicit and reflected in order to avoid bias on the basic level of the composition of samples. In the case of organ transplantation, for example, there has been quite a lot of socio-empirical research on public attitudes. However, most of the studies simply seem to presume that only the patients who are in need of an organ are ‘affected’: Their interests and needs are often taken for granted and constitute the implicit normative perspective in which the whole problem is framed and discussed (e.g. as the problem of “organ shortage”). In this perspective, the general public is only taken into consideration insofar as they are perceived as potential donors whose morally problematic reluctance to donate their organs has to be overcome, e.g. by campaigns or financial incentives. Their own viewpoints and interests as persons potentially affected by organ donation often do not receive a corresponding degree of attention—which is ethically quite problematic. The direct inclusion of “lay people” in focus group discussions has shown (Schweda and Schicktanz 2009; Schicktanz and Schweda 2009) that being addressed as a future deceased donor (or living donor) constitutes an ethically highly loaded perspective. The idea of being seen as a sort of public organ reservoir by some doctors and patients in the case of brain-death lets them question whether there is a fair and consistent justification, since—e.g. in respect to testaments—the personal will retains strong social and legal binding force even beyond their death. Consequently, the selection of the public and/or patients for empirical studies in bioethics needs particular attention and justification. The normative aim of this methodology is to explore different voices and insights with moral relevance (while sheer heterogeneity might not be a sufficient replacement for particular experience). To this end, current discussions in political theory about the limits of liberal representation can be made productive for bioethics. Adopting the concept of political group representation as defended by social philosophers such as Iris Young and Melissa Williams (1998), the personal representation of affected persons can be normatively justified. Thus, a fair consideration of patients’ interests requires the inclusion of their own voices rather than the ‘neutral’ representation of their ‘interests’ by professionals and functionaries. Of course, all selected voices have to be framed and interpreted with a critical eye on hegemonic public discourses, especially insofar as they are influenced by the mass media (e.g. Gerhards and Schäfer 2009). The same holds true, however, for any expert analysis and expert involvement since media coverage about bioethical issues usually correlates strongly with the expert discourse (see e.g. for the German context: Grauman 2003). In addition to the ‘who’, a second normative concern with regard to the methodology is the ‘how’: How do we have to collect, analyse and represent public perspectives and attitudes in order to meet the ethical requirements? As far as the level of data collection is concerned, quantitative studies are widely seen as the “gold standard” for research on public opinions. They are representative for the respective population and claim objectivity and generalizability. In an ethical perspective, however, it seems that qualitative, participatory and deliberative methods are at least equally relevant insofar as we are interested in reconstructing broader contexts and resources of ethical argumentation in a highly differentiated form. After all, ethical perspectives require interpretive work and cultivation of collective meanings. It is also an accepted principle that differences of meaning and normative principle should be respected. In addition, public perspectives and concerns are usually multidimensional and complex, and often articulated in an indirect manner, as well as being dynamic and relational. All of these considerations lead to the conclusion that qualitative methods are necessary, even if not exclusively so. Indeed, a mixed methods approach might be a helpful way out of the classical dichotomy between quantitative and qualitative studies (see Tashakkori and Taddlie 2003), also by promoting a critical triangulation of premises and a reduction of methodological bias. However, both classical quantitative as well as qualitative approaches are still often limited with regard to active participation of lay people and patients in a deliberative discourse. It is beyond the scope of this article to discuss the options and limits of deliberative democracy in general. Here we focus on the role of the public within the academic framework of bioethics when stressing the methodological, normative and practical concerns. Of course, when it comes to the more general political framework of bioethics, one can extend this position and argue for more deliberative democratic structures in science policy. Thus, the public and the affected persons should not only be addressed as informants who respond to qualitative or quantitative questionnaires, but also as active political agents. From this point of view, deliberative approaches such as citizen conferences or public hearings go a step further in the claim for more direct representation: To strive for agreement amongst those affected within the framework of reasoned or at least narrative argumentative debates (Burgess et al. 2007; Means 2002; Myshkja 2007). This does not imply an exclusive practise of citizen conferences etc. in the biopolitical field, but could complement the dominant practise of expert advice (for a more extensive discussion of the pros and cons of applying participatory elements in biopolitics, see e.g. Schicktanz 2008). The inclusion of patients, representatives of patient organisations or members of disability groups into ethics boards and committees would be a first practical step in this direction. Existing power imbalances cannot justify their exclusion from the discussion, but rather point at the necessity of exploring different (social scientific) methods of empowering them to raise their own voices. Here is not the space to discuss all advantages and disadvantages of the different methods used in empirical ethics. However, we want to stress that the choice of the methods itself has to be justified not only with regard to methodological standards in social science, but also in view of underlying normative premises (e.g. reflection on power (im-)balances, normative ideals of communication and deliberation). We propose that an argumentative form of data collection should be given special, albeit not exclusive attention. The more elaborated the argumentative structure of the represented attitudes and public perspectives is, the more insights for ethical reasoning can be expected. Finally, there is the question of which concepts and approaches should be used to describe and analyse public positions in an adequate way. Traditionally, social research in this field frames these issues in terms of “values”, of individual attitudes that are measured by means of opinion surveys. For several reasons, this approach is not sufficient in view of the abovementioned ethical purposes. First, it usually serves a descriptive interest while the perspective of the ethically motivated approach is a normative one: Not only the propositional, statistical occurrence and correlates of attitudes are relevant, but also their normative content, weight and legitimacy. In this respect, sociological research surveying “values” is much too undifferentiated to be useful as a normative vocabulary for ethical debates. It often lacks ideational and argumentative context and ignores the significance of collective, cultural forms (Means 2002). Broader resources of moral reasoning have to be taken into account in order to assess moral claims from a normative point of view. Thus, especially in the context of a deficit model of PUS, with its attendant problematic normative impositions (Wynne 2006), quantitative research can unfold the dynamic of a self-fulfilling prophecy: Public positions are made to look irrational by analytical concepts and methods which separate them from their multidimensional socio-cultural contexts, their concrete ideational and motivational backgrounds, and their rich argumentative resources, reducing them to isolated “opinions” or “values”, instead. Qualitative research and especially deliberative and participatory approaches can give a finer grained picture of ethical arguments and their ideational and motivational resources. Therefore, they are important instruments for detecting misrepre sentations of public views and interests. Additionally, they allow a critique of the instrumentalization of quantitative statistical findings. It is not so much that these are false, but that such methods, more powerful in some limited respects, can only exercise that extra statistical power correctly on simple responses to simple questions. E.g. it is often stated that many public surveys show peoples’ high acceptance of organ donation which is used as an argument for introducing presumed consent solutions. However, the number of those who actually have a donor card is much lower. Obviously, the survey data does neither sufficiently explore the difference between general attitudes and contextualised decisions nor explain irritations, misunderstandings, and resistance. In the light of our considerations, taking the public understanding of ethical issues into account for discussion on bioethical questions is not just the “cherry on the cake,” as if some pleasant and prestigious, but ultimately dispensable add-on. The implementation and further development of inclusive and reasonable forms of public exchange constitute a central bioethical concern. This is particularly true when bioethics is seen as an area that spans from theoretical considerations and academic teaching to policy advice and even biopolitics. Especially when the concept of ethical expertise and its role in democratic policies is connected to the idea of strong justification (Weinstein 1994), ethical reasoning has to face the challenge and stand the test posed by the actual diversity of—affected, situated and embodied—standpoints, perspectives, interests, and meanings. A bioethical position that fails to do this, and which thus avoids the confrontation with different public arguments, including ones perhaps based in different cultural histories, relations and ontological grounds (Benhabib 1996; Williams 1998), not only runs the risk of missing important aspects, ideas and arguments. It also arouses strong suspicion of being indeed one-sided, biased or ideological—thus illegitimate. Insofar, recent polemics against the “ethics industry” (see above) have to be taken seriously as an expression of criticism as far as uncritical and poorly founded “expert-centrism” and its blind spot concerning public understandings of ethics still exists. By including the public more explicitly into its methods and considerations—which does not at all mean a romantic uncritical subservience to any public view—, bioethics could avoid the “tragic choice” (Scofield 2008) between democracy and expertise and be more than just part of an obscure “ethics industry”: A constructive element of a dynamically learning, modern, liberal and democratic policy in the fields of biomedicine and biotechnology. A first step in this direction would be to pursue systematically the “empirical turn” in academic bioethics in order to level out power imbalances implied in many applied bioethical theories. By focussing on voices, experiences and positions of those that have previously been excluded from, under- or misrepresented in the established expert discourse, we can explore how, where and when patient representatives are missing in ethics committees and national ethics councils. Against this background, the relevance of the current debate about “empirical ethics” can be revalidated (Schicktanz 2009). This debate is more than just another esoteric methodological controversy. Much more is at stake than the ‘is-ought gap’ or the professional identity of an academic discipline. The ‘empirical turn’ is not a threat to a pure academic rationality, but rather a way to increase the reasonableness and legitimacy of ethical considerations by expanding the forum—the agora, as Nowotny et al. (2001) put it—in which they have to demonstrate their persuasive power. This is expansion not only in political constituency, but in ethical and political, as well as intellectual quality. At the same time, methodological debates of social research and participatory tools gain a crucial normative relevance and turn methodological questions into ethical concerns: The sociological examination of public attitudes towards science and ethics is in need of ethics, itself. This marks a new area of collaboration between social science scholars and ethicists. All in all, the participatory turn has had quite impressive success: In the meantime, the role of participation has become so prominent in several countries, for example in the UK, that critical authors indeed speak of a „tyranny of participation” (Cooke and Kothari 2001). Against the background of our considerations, however, it is not so much the question of whether, but rather of how—in which spirit and with which methods—the public should be included. Of course, the inclusion of the public does not necessarily have to rely on direct participation. Depending on the respective purposes and framework conditions, it can also be implemented by means of representative mechanisms including forms of expert- and (partly new) media discourses. More important is that inclusion should strive for a deliberative, argumentative structure permitting and supporting richer argumentative exchange, and interpretations which include institutional self-reflection. The authors Schicktanz and Schweda were supported by a research and travel grant from the German Academic Exchange Programme. We like to thank the anonymous reviewers for helpful and constructive comments on structure and content of this paper. Daniels, N. 2003. Reflective equilibrium. In The stanford encyclopedia of philosophy (Winter 2003 Edition), ed. E. N. Zalta, URL = <http://plato.stanford.edu/archives/win2003/entries/davidson/>. Accessed 28th April 2010. European Commission. 2002. Science and Society Action Plan. Luxemburg: Office for Official Publications of the European Communities, http://ec.europa.eu/research/science-society/pdf/ss_ap_en.pdf. Accessed 28th April 2010. Jollimore, T. 2006. Impartiality, Standford Encyclopedia of Philosophy, http://plato.stanford.edu/entries/impartiality/#CogImpImp. Acessed April 28th 2010. President’s Council on Bioethics. 2001. Executive order 13237 http://frwebgate.access.gpo.gov/cgi-bin/getdoc.cgi?dbname=2001_register&docid=fr30no01-151.pdf. Accessed 28th April 2010.